The 1992-93 Chicago Bulls, led by Michael Jordan, overcame a 2-0 deficit in the Eastern Conference Finals against the New York Knicks and eventually capped off their 57-25 record with their third straight NBA Championship. The Bulls defeated the Phoenix Suns, who had the NBA regular season best record of 62-20. This beautiful banner was hung from the old Chicago Stadium after this championship season. This now off-white 9 Ft, 8 IN x 14 FT, 4 IN vinyl banner with red borders was the very banner that was proudly displayed at “The Madhouse on Madison” until it’s closing in 1994. 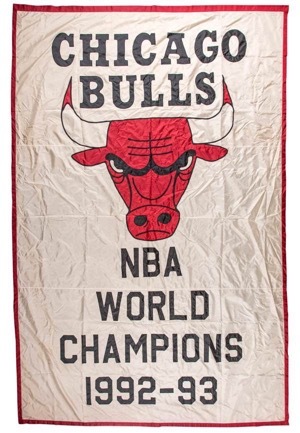 This banner reads “CHICAGO BULLS” sewn on in black lettering at the top with the Bulls’ “Bull” below. 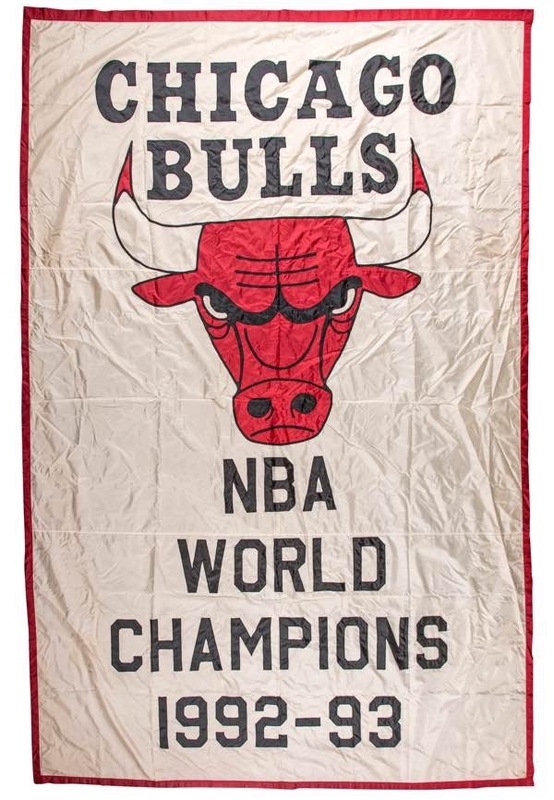 Below the “Bull” is sewn on “NBA WORLD CHAMPIONS 1992-93”. This banner is in excellent condition with minor toning that gives it its off-white look and minor thread pulls on the a couple of the sewn on letters. The top of the banner has a stitched opening which was used to hold it up. A rare piece commemorating the third of six Championships the Bulls would win the the decade.